This document is intended to provide an overview of how one can use the PyBioMed functionality from Python. If you find mistakes, or have suggestions for improvements, please either fix them yourselves in the source document (the .py file) or send them to the mailing list: oriental-cds@163.com and gadsby@163.com. You first need to install RDKit and pybel successfully. The PyGetMol provide different formats to get molecular structures, protein sequence and DNA sequence. In order to be convenient to users, the Getmol module provides the tool to get molecular structures by the molecular ID from website including NCBI, EBI, CAS, Kegg and Drugbank. The Getmol module also provides the tool to read molecules in different formats including SDF, Mol, InChi and Smiles. Users can read a molecule from string. Users can also read a molecule from a file. The GetProtein module provides the tool to get protein sequence by the pdb ID and uniprot ID from website. The GetDNA module provides the tool to get DNA sequence by the Gene ID from website. >ENA|AA954964|AA954964.1 op24b10.s1 Soares_NFL_T_GBC_S1 Homo sapiens cDNA clone IMAGE:1577755 3&apos;, mRNA sequence. The PyPretreat can pretreat the molecular structure, the protein sequence and the DNA sequence. Normalization of functional groups to a consistent format. Breaking of bonds to metal atoms. Competitive reionization to ensure strongest acids ionize first in partially ionize molecules. Standardization or removal of stereochemistry information. Filtering of salt and solvent fragments. Generation of fragment, isotope, charge, tautomer or stereochemistry insensitive parent structures. Validations to identify molecules with unusual and potentially troublesome characteristics. The user can diconnect metal ion. Pretreat the molecular structure using all functions. The user can check the protein sequence using the PyPretreatPro. If the sequence is right, the result is the number of amino acids. If the sequence is wrong, the result is 0. The user can check the DNA sequence using the PyPretreatDNA. If the sequence is right, the result is True. If the sequence is wrong, the result is the wrong word. The PyBioMed package could calculate a large number of molecular descriptors. These descriptors capture and magnify distinct aspects of chemical structures. Generally speaking, all descriptors could be divided into two classes: descriptors and fingerprints. Descriptors only used the property of molecular topology, including constitutional descriptors, topological descriptors, connectivity indices, E-state indices, Basak information indices, Burden descriptors, autocorrelation descriptors, charge descriptors, molecular properties, kappa shape indices, MOE-type descriptors. Molecular fingerprints contain FP2, FP3, FP4,topological fingerprints, Estate, atompairs, torsions, morgan and MACCS. We could import the corresponding module to calculate the molecular descriptors as need. There is 14 modules to compute descriptors. Moreover, a easier way to compute these descriptors is construct a PyMolecule object, which encapsulates all methods for the calculation of descriptors. The GetConnectivity() function in the connectivity module can calculate the connectivity descriptors. The result is given in the form of dictionary. The function GetTopology() in the topology module can calculate all topological descriptors. The function CATS2D() in the cats2d module can calculate all CATS2D descriptors. The PyMolecule class can read molecules in different format including MOL, SMI, InChi and CAS. For example, the user can read a molecule in the format of SMI and calculate the E-state descriptors (316). The object can also read molecules in the format of MOL file and calculate charge descriptors (25). In order to be convenient to users, the object also provides the tool to get molecular structures by the molecular ID from website including NCBI, EBI, CAS, Kegg and Drugbank. The code below can calculate all molecular descriptors except fingerprints. In the fingerprint module, there are eighteen types of molecular fingerprints which are defined by abstracting and magnifying different aspects of molecular topology. The CalculateFP2Fingerprint() function calculates the FP2 fingerprint. The CalculateEstateFingerprint() function calculates the Estate fingerprint. The function GhoseCrippenFingerprint() in the ghosecrippen module can calculate all ghosecrippen descriptors. The PyMolecule class can calculate eleven kinds of fingerprints. For example, the user can read a molecule in the format of SMI and calculate the ECFP4 fingerprint (1024). PyProtein is a tool used for protein feature calculation. PyProtein calculates structural and physicochemical features of proteins and peptides from amino acid sequence. These sequence-derived structural and physicochemical features have been widely used in the development of machine learning models for predicting protein structural and functional classes, post-translational modification, subcellular locations and peptides of specific properties. There are two ways to calculate protein descriptors in the PyProtein module. One is to directly use the corresponding methods, the other one is firstly to construct a PyProtein class and then run their methods to obtain the protein descriptors. It should be noted that the output is a dictionary form, whose keys and values represent the descriptor name and the descriptor value, respectively. The user could clearly understand the meaning of each descriptor. The user can input the protein sequence and calculate the protein descriptors using function. PyBioMed also provides getpdb to get sequence from PDB website to calculate protein descriptors. The PyProtein can calculate all kinds of protein descriptors in the PyBioMed. For example, the PyProtein can calculate DPC. The PyProtein also provide the tool to get sequence from Uniprot through the Uniprot ID. The PyProtein can calculate all protein descriptors except the tri-peptide composition descriptors. Calculating six pseudo nucleotide composition features, which can be used to represent a DNA sequence with a discrete model or vector yet still keep considerable sequence order information, particularly the global or long-range sequence order information, via the physicochemical properties of its constituent oligonucleotides. The user can input a DNA sequence and calculate the DNA descriptors using functions. The user can check the parameters and calculate the descriptors. 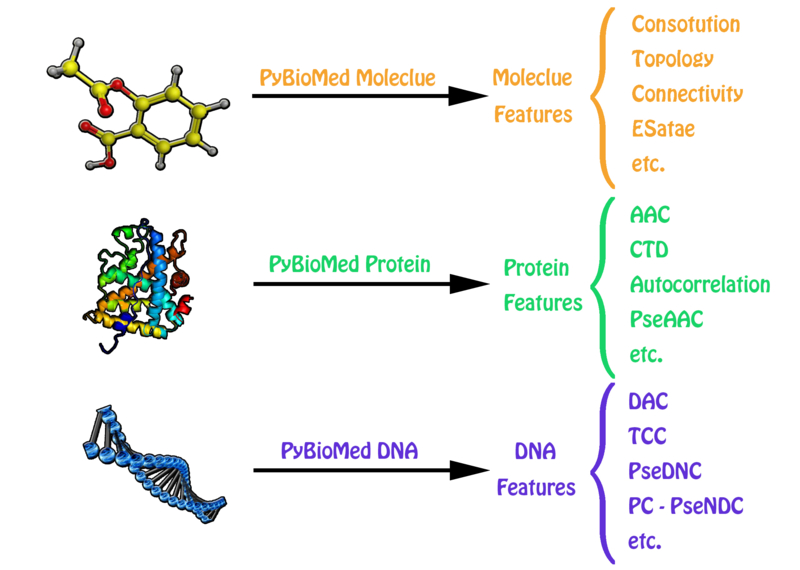 The PyDNA can calculate all kinds of protein descriptors in the PyBioMed. For example, the PyDNA can calculate SCPseDNC. 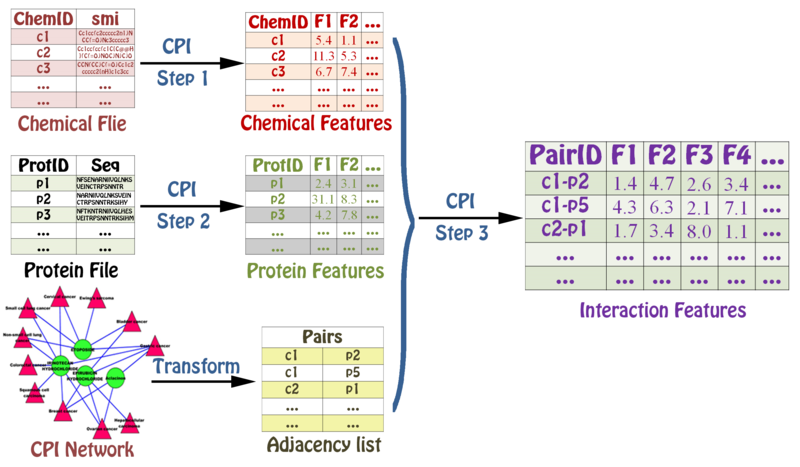 The PyInteraction module can generate six types of interaction descriptors indcluding chemical-chemical interaction features, chemical-protein interaction features, chemical-DNA interaction features, protein-protein interaction features, protein-DNA interaction features, and DNA-DNA interaction features by integrating two groups of features. The user can choose three different types of methods to calculate interaction descriptors. The function CalculateInteraction1() can calculate two interaction features by combining two features. The function CalculateInteraction2() can calculate two interaction features by two multiplied features. The function CalculateInteraction3() is only used in the same type of descriptors including chemical-chemical interaction, protein-protein interaction and DNA-DNA interaction. The user can calculate chemical-chemical features using three methods . The calculation process for chemical-chemical interaction descriptors. The user can calculate chemical-protein feature using two methods. The calculation process for chemical-protein interaction descriptors. The user can calculate chemical-DNA feature using two methods. © Copyright Copyright @ 2015-2016 Computational Biology & Drug Design Group. Created using Sphinx 1.4.9.